I’ve been watching today as the “experts” come out of the woodwork with their commentaries on Benedict XVI‘s retirement. It’s amazing how many Kresgin wannabe’s think they can read the man’s mind. “He’s retiring because the job’s too hard.” “He’s retiring because of the child abuse scandal.” How about this: The man is 85 years old! He’s suffering from the effects of old age. He wants to spend his remaining time on earth getting ready for the life to come. I’d like to suggest that the so-called experts get back to us when they’re 85 and let us know if they still want to hold a 24-hour a day job. The logical next step is for the pundits to make their predictions about who the Cardinals will select to replace Benedict. It’s amazing how many people think they have some insight on how 120 or so men from all over the world are going to vote. The common denominator of almost all popes has been that everyone was surprised that they were chosen. Stop wasting your time trying to predict what the Holy Spirit is going to do! You’ll just look foolish. The next big issue is whether the new Pontiff will be “liberal” or “conservative”. This drives me crazy! This isn’t politics. This is the Church created by Jesus Christ more than 2,000 years ago. When it comes to the teachings of the Church there is no such thing as liberal or conservative. As Catholics we have two choices. We either accept everything the Church teaches or we don’t. If we choose not to accept 100% of what She teaches, we’re not “liberals”, we’re heretics. If we choose to override Jesus’ teachings, Jesus’ Church, then we’re trying to make ourselves gods and what that leads to isn’t going to be pretty. One of those things that we must accept as Catholics is that the Holy Spirit will guide our Cardinals in making the correct choice. As my son pointed out on facebook today, the Catholic-bashers are already making their presence known. This (the Pope’s resignation) is just one more excuse for them to hurl their anti-Catholic venom in our direction. These people are so blinded by hate for what they think the Catholic Church teaches, that they’ll completely miss the beauty and dignity of the replacement process. I feel sorry for them. This is a time of great challenges and great opportunities for the Church. 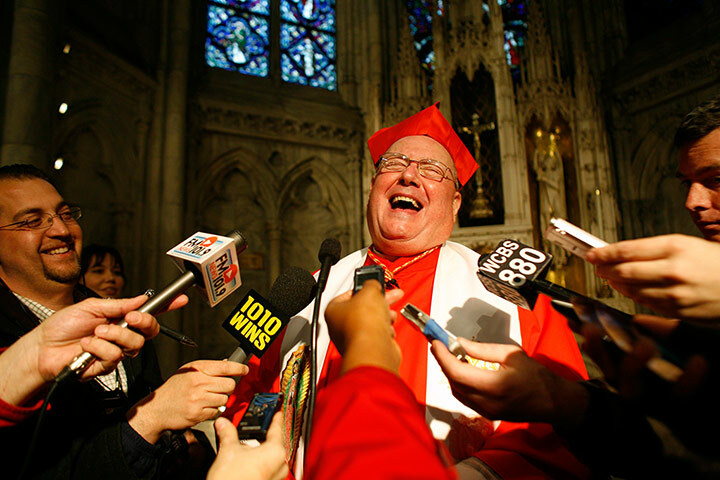 In the weeks ahead the Cardinals are going to get together and decide who our next Holy Father will be. Instead of wasting our time reading and listening to people who haven’t the faintest idea what they’re talking about, how about you and I spend some time on our knees asking the Holy Spirit to guide our Cardinals in making the best choice. 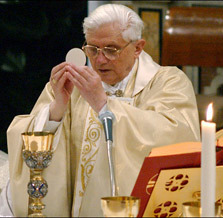 Pray, too, that Benedict XVI will live the remainder of his earthly life in peace, tranquility, and good health. And pray that whoever the new Pope may be, that we will have the grace and wisdom to listen to what he has to say and give him the respect that his holy office deserves. Yesterday I posted that the Holy Father had joined Twitter, an excellent example of how we can all use social media to evangelize. One tweet in particular caught my attention. How do you interpret this? I think this quote shows how poorly written English can express a point of view. Is he saying that since we live in a world without hope we can’t live our faith in Jesus? If so, it’s a very disturbing thing to say. Or, is he saying that, since we do live our faith in Jesus, this is most definitely not a world without hope? I think it’s clearly the latter. Those of us who write and speak about our faith must be careful with our choice of words. Since Benedict tweets in several different languages, I’m sure someone in his office translated this thought into English. Even though he is the Pope, he still has to work within Twitter’s 140 character limit. That’s why I seldom use Twitter myself. We can all be thankful that the Holy Father is taking the time to communicate with us via this new medium. I’m pretty sure that Jesus would have a Twitter account, a facebook page, and a web site. Today is the twelfth day of the twelfth month or the year 2012 or 12/12/12. There’s no particular significance to the day except as a curiosity of the calendar. It is worth mentioning though that this won’t happen again in most of our lifetimes. The next triple number day will be January 1, 2101 or 1/1/01. So if you enjoy this sort of thing, today is your day. Maybe the most significant thing about 12/12/12 is that it’s the day that our Holy Father, Pope Benedict XVI joined Twitter. As I write this, he has posted five times in six hours and has 840,750 followers. I don’t know if that’s any kind of record, but it’s very impressive. Sadly, many of the comments to the Holy Father’s tweets so far have been negative and hateful. That should be a lesson for all of us. When we put ourselves out there, proclaiming the Good News, we’re going to attract haters. I say this from personal experience. Like the Benedict, we’re called to ignore the negative, hang on to the positive, and continue to fight the good fight. If you’re into Twitter, I hope you’ll follow the Holy Father and show your love and support. Stop the presses! In the time it took me to write this, the Pope has tweeted two more times and now has 845,766 followers or about 15,000 more in about ten minutes. Considering that it’s still early morning in a big part of the world, I suspect he’ll have 1,000,000 followers before the day is over. Follow the Holy Father on Twitter.